Last week I spoke about the Moonflower Vine and mentioned it is my favorite plant of all time. However, as you’ll soon find in this blog, I actually enjoy many different types of vines. I didn’t realize I was such a “vine person” until I began looking around my back yard fence one year and counted the many varieties I had planted. Some were annuals and some were perennials. In the annual category I had Moonflower, Morning Glory, Cardinal Vine and Birdhouse Gourds. In the perennial category, I had (and still have) Wisteria, Honeysuckle, and Clematis. I admit, Clematis is the show stopper of all vines. It is absolutely gorgeous. The pictures in this post are that of my Jackmanii Clematis that is planted on the western-facing fence adjacent to my driveway. I also have a couple of other Jackmanii Clematis’ planted on the west side of my house (between my house and my neighbor’s) that climb a 7 foot trellis every year, reaching up to the sunshine. Attention! Attention! The previous statement speaks of an odd, but very key, trait of the Clematis. It likes its feet cool, but loves the warmth of the sun on its body and face, so to speak. In other words, you must find an area in your yard to plant the Clematis whereby the base of the vine (its roots) will stay cool and shady, but where its stems and leaves will be able to twine and grow up to an area of bright sunshine. No need for all day sun – but at least 6 hours of sunshine is required for optimal blooms. For example, in my particular cases, the Clematis near my driveway is planted in a cement bordered area that is heavily mulched. It receives the western sun for about 7 – 8 hours from mid fence up, but due to the shade from my garage overhang, its base stays pretty shady all day. The Clematis Vines I have planted between my house and my neighbor’s receives shade at its base all day except for about 2 hours at mid-day when the sun is directly overhead between our houses. (My neighbor’s home is a 2-story). As the sun moves across the sky in the afternoon, the vine must grow and twine to the top of the trellis to be able to reach the indirect rays of the sun. This makes for perfect conditions for this plant. Actually, I was ecstatic when I finally found a plant that would work in this odd area between the houses. Other vines, such as English Ivy and Carolina Jasmine would live for a season but not do very well thereafter. They would eventually contract some sort of fungus or pest due to the dampness below and would usually burn at the top. Never did they fill the trellis as fully as the Clematis. Clematis is just uniquely suited for this type of “hard to grow anything area”. 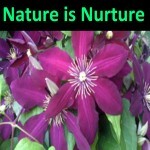 But don’t fret if you don’t have the perfect place for Clematis au naturel. You can create your own optimal spot by first locating an area of at least 6 hours of sunshine in your yard, near a fence is optimal, but you can simply install a free standing trellis or garden obelisk. Then, devise a taller than usual edging around your planting area – perhaps even place a large decorative rock or two around the edging to potentially add more shade to the vine’s roots. The very good news about Clematis is that not only is it beautiful once it is established, it has almost nil pest and disease issue. This in itself is reason enough to give Clematis a try! This entry was posted in Plants, Uncategorized and tagged beautiful blooming vine, perrenial vines, purple flowers, vines. Bookmark the permalink.